I guess this is the longest lapse in updating the website I’ve had, but wow has there been a lot going on! I’ve had some questions on what pre-filling procedures we use at Yazoo and since wood barrels are readily available to home brewers nowadays I thought we would go over our techniques. But first let’s rewind the calendar to October 2nd, 2014 in Denver for yes…The Great American Beer Festival. The first night we were in town we served up 3 different beers at What The Funk? Once again it was an awesome night put on by Crooked Stave that gathered brewers from all over serving up their finest funky beers. We served Lignage A Trois (100% Brettanomyces Fermented Red Ale with Raspberries aged in barrels that once held Jack Daniels, then Arrington Vineyard’s Antebellum Red Wine then our beer.) Saison Colada (Aged with Coconut, Prickly Pears, Kiwi and Black Tea Leaves). Session Sour 1 (3% Sour Brown Ale aged on Orange Liqueur French Oak). 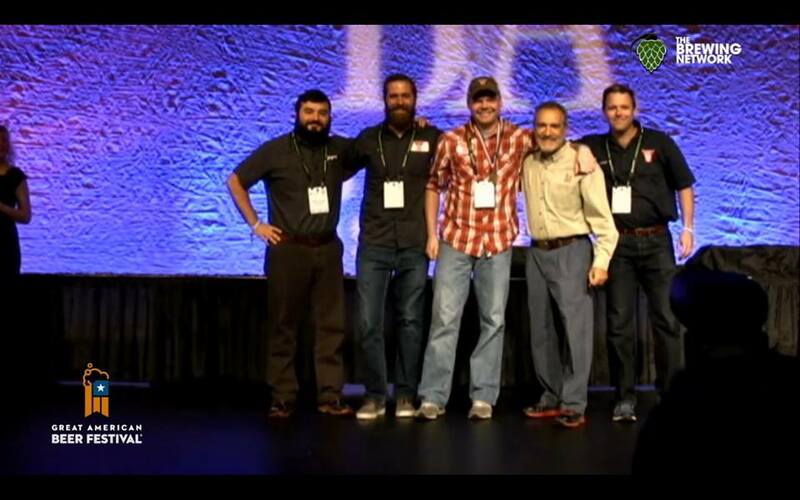 By far the best day of the trip was Saturday morning at the GABF Awards ceremony. 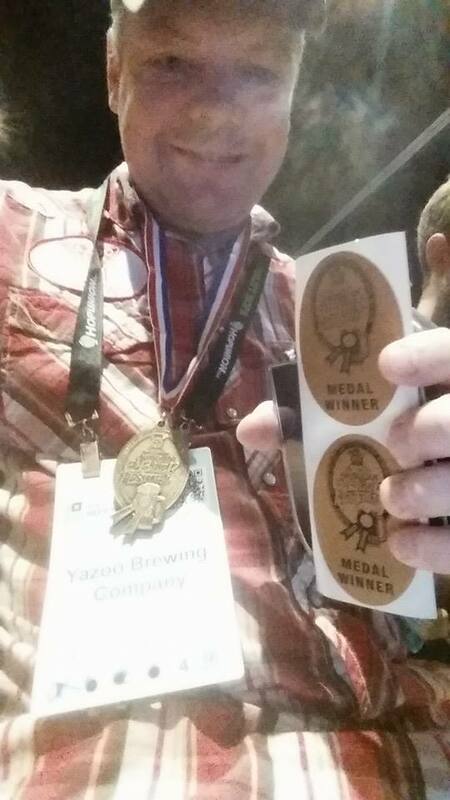 This was my first GABF where I’ve had a beer in the professional categories, I’ve had beers in the Pro-Am contest, but this was a different feeling. Linus, Neil, Josh and myself sat in the audience and anxiously awaited for our categories to come up. 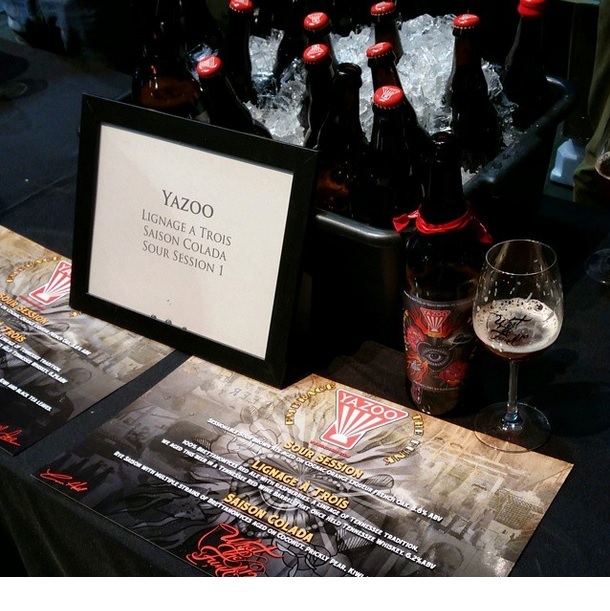 Then it finally happened: Category 26 – Wood and Barrel Aged Sour Beer Bronze “Yazoo Embrace The Funk Cherry Deux Rouges”. Whoa, I swear it felt like time slowed down for a few seconds. I thought back to sitting on my couch starting this website, to my first sour beer over 10 years ago, to all the homebrew comps and now there it is up on the big screen. Linus at this point leans over smiling and says “You’ve gotta get up, we need to head to the stage”. I tried to take a picture of the screen but I was so excited the pic was blurry as heck. Walking up to and across the GABF stage for the first time (hopefully not the last) to meet Charlie Papazian was something yeah of course I wanted to happen for years, but didn’t expect it would this soon. I could not have been more proud to be on that stage with Linus, Neil and Josh. Those guys and the rest of the crew at Yazoo are what makes our ETF program happen. 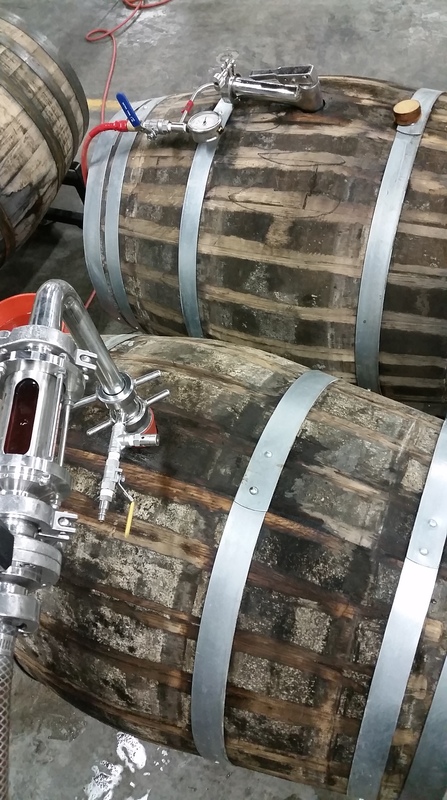 FYI Deux Rouges Batch 2 has been in the barrels for about a year now. It’ll release in early 2015. We are brewing Batch 3 in a couple weeks. The barrel cellar build continues. We are expecting some more equipment this week, mainly another stainless Brite tank. We have a great variety of barrels full of beer (Sangiovese, Cognac, Bourbon, Merlot, Sherry, Rum etc…) Once we get a few more things on order over these I’ll have a full post on the facility. Now about the barrel filling. Last December I wrote this article about barrel fixes and repairs. What we are going to talk about stems from a few questions on filling barrels. You have 2 categories: Barrel Aging or 100% Barrel Fermentation. 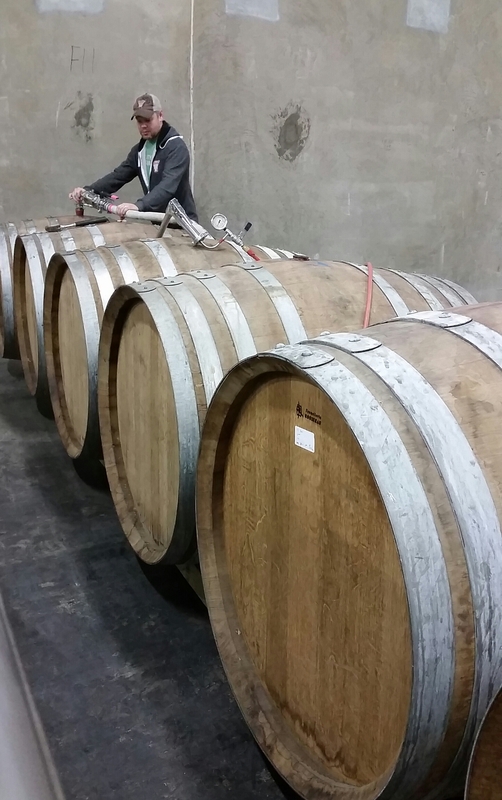 Barrel aging requires a bit more attention and care. Both have advantages/disadvantages and reasons why or why not to do them. Let’s start with Barrel Aging a beer. A lot of brewers will start a fermentation in stainless steel and once fermentation has finished or reached a certain gravity they transfer the beer into a barrel. This is a great technique since you have alcohol present it can cut down on the chance of a bacterial infection if you are brewing clean beers. It also gives you the control of doing a partial fermentation with a “clean” yeast then adding Brett/Bacterias upon transfer. But my favorite reason to start in stainless…less blow off clean up and less beer loss! Transferring a week or so into fermentation will still give some co2 production in the barrel that can help scrub out any o2. However you need to take a couple of steps before the beer hits the barrel to lessen o2 pick up. It’s really simple and that is to purge the barrel with co2 before filling. Its simple enough, but I’ve been a bit surprised to find out some production breweries don’t purge before fill. Co2 has a Molar Mass of 44.01 g/mol and our enemy at this point “Air” (made up of a number of components) adds up to a Molecular Mass of 28.97. So obviously c02 is heavier which will fall to the bottom and will push the “air” out from your barrel. A long tube such as a racking cane or a barrel filling gun will be most efficient. You will waste more c02 if you are filling from the top and possibly not evacuating all the air from the barrel. So you want to be as close to the bottom as possible. The picture on the right shows how I hook up our barrel filling gun to the house co2 feed. For a 60 gallon barrel I like to run ours at about 4-5 psi for about 5 minutes a barrel. A steady slow fill will create a nice layer and less turbulence inside the barrel. PSA- When purging barrels and using a lot of Co2, make sure you are in a ventilated area. 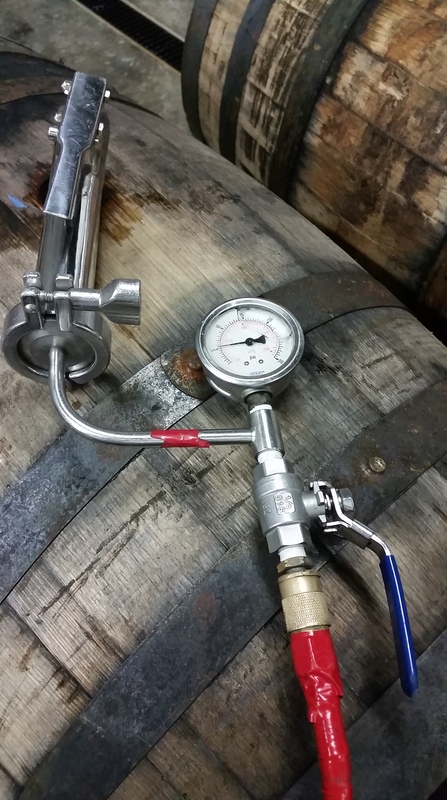 When I fill our barrels and casks I typically use our Gas Transfer Tool which you can see in the picture on the left. It goes all the way to the bottom of the barrel or cask and has a pointed “pin” on the bottom that helps stabilize the cane. Again a nice slow roll into the barrel is key, even though you have purged the barrel with co2 its just a good idea to fill it slowly. Remember to leave just a little bit of space for the airlock or bung. If you are barreling a beer that is still fermenting I’d suggest an airlock, breathable bung like these or a blow off tube instead of hard bunging the barrel. The co2 build up can cause leaks between the staves or blow outs…which is just more to clean up. As brewers we have enough to clean up as it is, so I prefer not adding to the list. When doing a 100% Barrel Fermentation oxygen pick up isn’t much of big of a deal. Most brewers will invite some o2 in the beginning for yeast health or for character development. When I’ve done 100% barrel fermentation I just use our barrel gun and no purging prior to filling. Blow off tubes are my preference, but again breathable bungs can work well. Cheers and as always thanks for the support! Would you be willing to share a parts list for your CO2 purge system? We are getting ready to purge a number of barrels before filling and had not figured out the best way to purge them. Thanks in advance! Any chance you’d be willing to share the equipment list for the CO2 purge manifold you use? We’re getting ready to fill some barrels and that seems like a much more effective and efficient method of purging barrels than we had planned. Thanks in advance!